While the possibility of your pet being poisoned in your home may seem unlikely, the reality is poisoning happens much more often than you would think. Preventing pet poisoning can be as simple as taking an hour or two to “poison proof” your home – inside and out. The week of March 18-24 is Pet Poison Awareness week, so why not take some time this weekend to ensure that your home is as safe as can be for your fur (and feathered) babies! Many cleaning supplies are caustic and can cause chemical burns to your pet’s mouth and gastrointestinal tract. Keep all cleaning supplies, including laundry and dishwasher detergent pods, safely out of reach of dogs and cats. Be mindful that cats, curious by nature, can open partially closed containers, so keeping all cleaning supplies in secure cupboards is vital. Keep your toilet lid closed, especially if you use an automatic toilet bowl cleaner. Many plants are toxic to both cats and dogs. Lilies from the Lilium and Hemerocallis family (e.g., Easter lilies, tiger lilies, and stargazer lilies) are extremely toxic to cats. Exposure to any part of the lily, or even the water from a vase or plant saucer, can cause kidney failure in cats. Tulips and daffodils can brighten a late winter day, but can also be toxic if the bulbs are consumed by a playful puppy or curious cat. If in doubt, gift your plants to a friend who doesn’t have pets! Over-the-counter and prescription medications must be stored in secure cupboards or cabinets. Common pain killers (e.g., Tylenol, Excedrin), non-steroidal anti-inflammatories (e.g., Advil, Aleve, Motrin), inhalers (chewing the canister open), antidepressants, sleep aids, and medications for high blood pressure, heart conditions, and thyroid problems – the list goes on – can all cause serious problems if consumed by your pet. Dogs will often chew on batteries found in toys, game controllers, and remote controls. Cell phones are also a tempting “chew toy” so be sure to keep these items out of reach of your pet. Button batteries can be especially dangerous as they are easy to chew and swallow, and can cause severe burns to your pet’s mouth and gastrointestinal tract. Loose change (especially U.S. pennies), nuts and bolts, sunblock and diaper rash ointment, and cold remedies and lozenges ­­­­­­­contain high levels of zinc. Life-threatening zinc poisoning is possible after consuming just one penny. Keep these items well out of reach of your cats, dogs, and birds. Although most people know not to give alcohol to their pets, some pets will sneak a sip of an unattended glass of beer or wine, so keep drinks out of reach. Unbaked bread or pizza dough is another source of alcohol and can cause alcohol poisoning very quickly when consumed. Grapes and raisins are extremely toxic to dogs, causing kidney failure. It is easy to forget about the raisins in baked goods, cereals, granola, and trail mix. 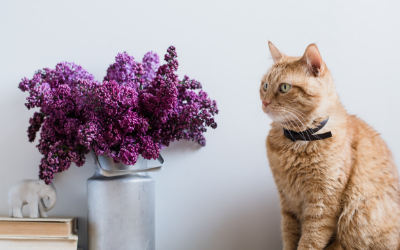 All plants in the onion family – garlic, leeks, and onions, and even chives and Allium, common garden plants – are toxic to cats and dogs, causing red blood cell rupture and severe anemia. Xylitol is a natural substance that is often used as a substitute for sugar in candies, gum, mints, packaged baked goods, pudding snacks, toothpaste, and a multitude of other household products. It is extremely toxic to dogs, even in small amounts. Keep all candies, mints, and gum (fresh and chewed) out of reach of your pet – that includes the garbage! Be sure that knapsacks, handbags, and briefcases are stored in an inaccessible closet or cupboard. Check your shed or garage to ensure that your pet does not have access to these products. Keep in mind that rodents can carry rodenticides (rat poison) to areas accessible to your pets. Wipe up spills and clean spill areas with lots of water. Sweet tasting antifreeze is especially toxic. As little as 1 tablespoon can cause kidney failure in dogs, and 1 teaspoon can be fatal to cats. Using snail or slug bait with metaldehyde in your garden can be deadly to your dog or cat – use non-toxic alternatives and remove all traces of metaldehyde in your garden. With a little effort, most pet poisonings are preventable. If you suspect that your pet has gotten into any of the items mentioned above, call your veterinarian immediately. Be ready to tell them what your pet has consumed, how much, and when, so they can best determine the level of urgency and plan of care. Remember, an ounce of prevention is still worth a pound of cure! Take the time to poison proof your home. Meet the Veterinarians & veterinary team of Beach Park Animal Clinic in Tampa, FL! We’re pleased to provide exceptional vet care for your pets in the South Tampa area! © 2019 Beach Park Animal Clinic.